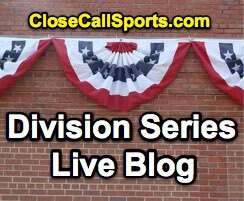 Join us for discussion of the 2018 American League and National League Division Series. Umpires Mike Muchlinski (NL COL@MIL), Adrian Johnson (NL ATL@LAD), Chris Conroy (AL CLE@HOU), and Cory Blaser (AL NYY@BOS) are your game one plate umpires. Also guaranteed plate games are Kerwin Danley and Ted Barrett (NL COL@MIL), Lance Barksdale and Gary Cederstrom (NL ATL@LAD), Chad Fairchild and Jerry Layne (AL CLE@HOU), and Dan Bellino and Mike Winters (AL NYY@BOS). Related: 2018 Wild Card & Division Series Umpires (10/2/18). Home plate umpire performance is listed following the completion of each contest according to UEFL f/x (Statcast/pitch f/x data and application of UEFL Rules 6-2-b-a [horizontal bound, "Kulpa Rule"] and 6-2-b-b [vertical strike zone, "Miller Rule"]). Non-callable pitches, such as fouls, swinging strikes, balls batted into play, pitchouts, and hit-by-pitches, are excluded from the analysis. - 10/4, COL@MIL 1: Mike Muchlinski: pfx. 107/108 Balls + 40/44 Strikes = 147/152 = 96.7%. +1 COL.
- 10/4, ATL@LAD 1: Adrian Johnson: pfx. 111/112 Balls + 47/52 Strikes = 158/164 = 96.3%. +4 LAD. - 10/5, CLE@HOU 1: Chris Conroy: pfx. 94/96 Balls + 44/49 Strikes = 138/145 = 95.2%. +2 CLE. - 10/5, COL@MIL 2: Kerwin Danley: pfx. 96/96 Balls + 39/43 Strikes = 135/139 = 97.1%. +0 Nu. - 10/5, NYY@BOS 1: Cory Blaser: pfx. 117/117 Balls + 41/51 Strikes = 158/168 = 94.0%. +0 Nu. - 10/5, ATL@LAD 2: Lance Barksdale. pfx. 69/71 Balls + 30/32 Strikes = 99/103 = 96.1%. +2 LAD. - 10/6, CLE@HOU 2: Chad Fairchild: pfx. 85/85 Balls + 37/39 Strikes = 122/124 = 98.4%. +0 Nu. - 10/6, NYY@BOS 2: Dan Bellino: pfx. 109/109 Balls + 52/56 Strikes = 161/165 = 97.6%. +0 Nu. - 10/7, MIL@COL 3: Ted Barrett: pfx. 92/92 Balls + 54/56 Strikes = 146/148 = 98.6%. +0 Nu. Series Complete (NLDS MIL Over COL 3-0): 428/439 = 97.5%. Net Skew +1 COL.
- 10/7, LAD@ATL 3: Gary Cederstrom: pfx. 138/139 Balls + 37/40 Strikes = 175/179 = 97.8%. +0 Nu. - 10/8, HOU@CLE 3: Jerry Layne: pfx. 122/124 Balls + 54/58 Strikes = 176/182 = 96.7%. +0 Nu. Series Complete (ALDS HOU Over CLE 3-0): 436/451 = 96.7%. Net Skew +2 CLE. - 10/8, LAD@ATL 4: Tom Hallion: pfx. 120/123 Balls + 35/38 Strikes = 155/161 = 96.3%. +2 LAD. Series Complete (NLDS LAD Over ATL 3-1): 587/607 = 96.7%. Net Skew +8 LAD. - 10/8, BOS@NYY 3: Mike Winters: pfx. 121/123 Balls + 46/51 Strikes = 167/174 = 96.0%. +1 BOS. - 10/9, BOS@NYY 4: Angel Hernandez: pfx. 94/94 Balls + 51/54 Strikes = 145/148 = 98.0%. +1 NYY. Series Complete (ALDS BOS Over NYY 3-1): 631/655 = 96.3%. Net Skew +0 Neutral. The highest plate score during the 2017 Division Series was Fieldin Culbreth's 97.2% (NLDS Gm 3).